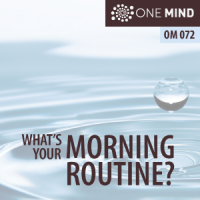 OM072: What’s Your Morning Routine? How do you start your day? Do you take time to cultivate the conditions for success and thriving, whatever that looks like for you? It’s an important question and one that I think about a lot. I am a huge fan of morning routines. And the thing is, if you’re interested in change. If you’re interested in making your days richer, more, productive, and more meaningful overall, there is probably no greater simple change you can make to your life than optimizing your morning routine. See here’s the thing. I lived in a meditation ashram for 14 years. Everyday we started out with 2 hours of meditation. For some years, before the meditation we might would also do 15-45 minutes of prostrations. On Sundays we’d often meditate all day from sunrise to sundown. But the point is, the religious traditions of the world figures this out eons ago. Religious or not, spiritual or not, how you start your day has a huge impact on everything that comes after. Think about an archer. When she notches an arrow in her bow and lifts it to the sky, everything matters. The slightest shift up or down, left or right, can dramatically alter the course and distance of flight. How far she pulls it back and how smoothly she releases it. All these factors fundamentally determine the arc and trajectory of the arrow through space. Likewise, when you and I start our days, how we emerge into each day as we transition from slumber to activity makes a huge difference. This is why so many meditation teachers recommend that you start each day with practice. Aligning your mind and being first thing in the day has a huge effect on your day. You see, we are the arrows and the archer. I use my mornings to read contemplative passages, then I pray, then I meditate, then I exercise. If I have time, I also journal. The thing is, once you start doing something like this, you start to see very quickly the impact it has on your mind. You feel more focused in your day. Your more centered. You feel the dignity and satisfaction of accomplishing something first thing in the morning. If you include meditation, you taste the silence and that brings peace into your being. If you’re very still, that will enhance the quality of your attention throughout the day. If you relax, that will affect your equilibrium in the face of inevitable adversity. All of these things enhance your experience of life itself and they support you capacity to respond to life more fully. The thing is, your morning routine can be a simple discipline which will quickly evolve into a habit. And this is so good for your mind. Start your day with discipline, and you’re tending the garden of your soul and spirit. We all need discipline. That’s how we grow and thrive. Think of a garden. The plants need pruning. They need to be watered. You need to weed the soil. It’s a constant effort, but it yield the most amazing fruit if we attend to it. It’s the same with your mind and spirit. We need to nurture and attend to it every single day so we continue to thrive and attend to the things that are most important. Meditation, is one of the very best ways to start your day and establish the kind of routine that will change your life for the better. Hi Julia, Thanks for your kind vote of confidence. I will definitely keep them coming :-)!